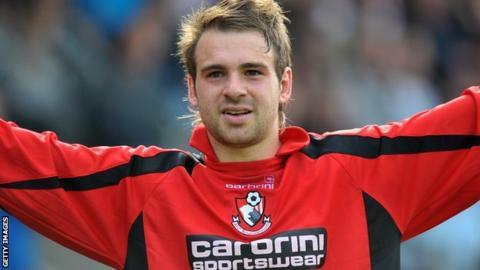 Brett Pitman's brace helped Bournemouth defeat Crewe as the Cherries claimed their fifth successive victory to move top of League One. After an open first half, in which both sides had chances, the visitors went ahead from Pitman's penalty for Mathias Pogba's challenge on Matt Ritchie. Pogba then made amends when he powered home a header from Kelvin Mellor's cross in the 79th minute. But Pitman drilled in Steve Cook's cross to earn his side three points. Pitman has now scored five times against Crewe in the last month, following a hat-trick, including two more penalties, in the Cherries' 3-1 win at Dean Court just 18 days ago. Victory moves Bournemouth a point ahead of Doncaster, who have a game in hand on Eddie Howe's side, while Crewe drop to 13th, now 10 points adrift of the play-offs. "We just feel robbed. We were every bit as good as them and deserved something from the game. We did enough to get a draw at the very least. "We've now played them twice in three weeks and had three penalties given against us. I don't know what to say. I've said enough to the referee and I got in trouble last time. "The decision he made changed the game. It looked fairly innocuous. The lad may have dived. There were no appeals from their players." "It's been a long road and the lads have won a lot of games to get to where we are and it hasn't been easy by any means. They deserve all the credit. "Away from home it's easy to find ways to get beaten. Even in tight games, the best teams always find a way to win. "Now we don't want to get caught. The challenge is to make sure nobody overtakes us."